Claddagh eternity ring features lab created emeralds in the 10K gold casting with white accenting. This emerald Claddagh ring has been hallmarked 10K gold by the Irish Assay Office at Dublin Castle in Ireland. This Claddagh ring is crafted in 10K yellow gold and it is in the eternity style with 3 solitaire lab created emeralds along with 2 solitaire CZ stones. 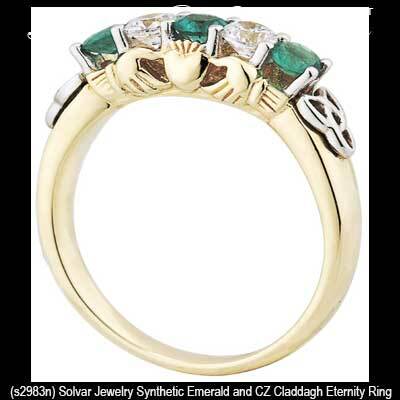 The Claddagh symbol is present on both sides of the ring and there are Trinity knots in 10K white gold on both sides of the emeralds. 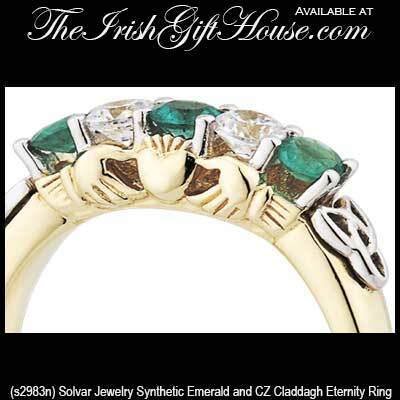 This emerald Claddagh ring is gift boxed with the Galway Folklore that explains how to correctly wear the Irish ring along with Celtic knot and Claddagh history cards, complements of The Irish Gift House. 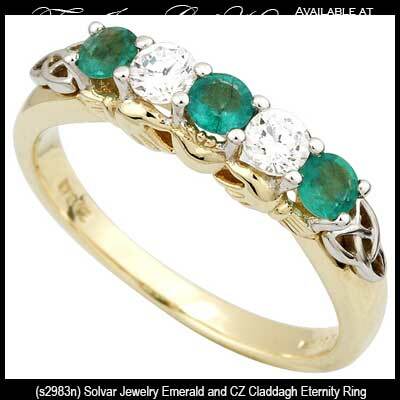 The piece of Irish jewelry is made by Solvar Jewelry in Dublin, Ireland. This emerald Claddagh ring is available in limited sizes. Gold Claddagh eternity ring features emeralds and diamonds and it is further enhanced with Celtic knots. Gold Claddagh ring features an emerald heart along with Celtic knots on the sides of the 10K design. Emerald Claddagh ring features a lab created stone heart along with 10K gold construction. Emerald heart Claddagh ring is cast in 14K gold and it is accented with diamonds.